TIRANA, March 12- The Organized Crime and Corruption Reporting Project (OCCRP) have made available a number of media reports alleging that several major European banks have been drawn into money-laundering activities centered on Russian origins. Several investigations are being done in the Baltic nations, the U.S., U.K. and Nordic countries. The Bloomberg writes that the International Monetary Fund has estimated the amount of money laundered globally per year to be 2 percent to 5 percent of global GDP, or as much as $2 trillion. The first to hit the papers was the Danish giant Danske Bank in 2018. The Estonian branch of Danske is suspected of handling iffy funds from former Soviet states. Bloomberg writes that Denmark’s biggest bank admitted in September 2018 that much of about $230 billion that flowed through its small Estonian unit between 2007 and 2015 was probably of suspicious origin. Even though Danske is currently being investigated by U.S. Department of Justice and the Securities and Exchange Commission, and authorities in Denmark, Estonia, the U.K. and France under these allegations, it did start a domino effect for other banks and their suspicious large money inflows. The latest bank caught in this scheme was Austrian Raiffeisen Bank International after a report filed by the Hermitage Fund. The Fund is urging authorities to investigate a ​​​​$967 million of suspicious money flows from Danske Bank and Lithuanian Ukio Bankas to Raiffeisen, as well as in other lenders in the country. These allegations and concerns are raised by Hermitage Fund’s and prominent Kremlin critic Bill Browder, claiming that Austrian banks have enabled Russian criminals to launder funds in the past ten years, by continually failing to respond to warning signs. “This illicit scheme would not have been possible without the gross negligence or acquiescence from the employees of Austrian banks,” Hermitage said. An article on the Raiffeisen Intl. involvement by addendum.org, an independent journalistic organization in search of “what’s missing”, wrote that the money landed according on a total of 1055 Austrian bank accounts at 78 banks. About $634 million flowed into accounts at the Raiffeisen Zentralbank (RZB), which has been a so-called correspondent bank of Ukio Bankas. Correspondent banks support other financial institutions in international business, such as cross-border money transfers. Browder stressed on the lack of attention paid to such money movements towards Austrian accounts. The complaint states that some of the companies sending money were unknown and had no business activities. Other companies lacked normal expenses, and some were shell companies registered in Belize, Seychelles, the British Virgin Islands, or Panama, countries with opaque jurisdiction. Hermitage stated that several money-receiving account-holders had no clear connection with Austria and conducted no business there. Many of the accounts sending money were linked to an organized criminal group, whose members include Russian government officials. Some of the funds moved were used to buy houses, charter yachts, and rent private jets. OCCRP takes as example in its written report on an Austrian account opened for a relative of a Moscow official, who received more than $4 million and later used it to purchase a 344 square meters apartment with a wine cellar in downtown Vienna. Hermitage places Raiffeisen Bank at the center of its allegations, naming it as the recipient of more than $600 million from Ukio Bankas accounts. These allegations are linked to what is named as the Troika Laundromat, created by once Russia’s largest private investment bank Troika Dialog. This system was discovered by OCCRP with Lithuanian news site 15min.lt. OCCRP writes that Troika Laundromat channels billions of dollars out of Russia. The Laundromat also allowed Russian oligarchs and politicians to secretly acquire shares in state-owned companies, to buy real estate both in Russia and abroad, to purchase luxury yachts, to hire music superstars for private parties, to pay medical bills, and much more. Hermitage places Raiffeisen Bank at the centre of its allegations, naming it as the recipient of more than $600 million from Ukio Bankas accounts. OCCRP and 15min.lt has previously exposed Ukio Bankas to operate the $6 billion financial system created by Russian investment bank Troika Dialog. Ukio was shut down in 2013 by regulators. There are other banks which are allegedly involved in this laundromat titanic scheme, like Helsinki-based Nordea and Sweden’s Swedbank. The sums that may have flowed through these banks are small change when comparing to Danske’s impressive standards, yet, as The Economist writes Nordea allegedly handled some 700 million euros, while $5.8 billion is reported to have moved between Swedbank and Danske. Hermitage claimed that money entering Austrian banks included $230 million allegedly stolen from the Russian treasury. OCCRP partners claim that Finland’s Nordea Bank and Germany’s Deutsche Bank have received 700 million euros and $889 million respectively in potentially dirty money from Ukio. The case, one of the biggest tax frauds in recent years, was exposed by Hermitage lawyer Sergei Magnitsky who subsequently died from ill treatment in prison. Austrian prosecutors could not be reached for comment and Raiffeisen says it is investigating the situation. As the materials prepared by the Hermitage Fund and provided by OCCRP are pretty convincing, has Raiffeisen Intl. served as a dirty Russian money laundromat? Raiffeisen is also the second biggest bank in Albania with annual profits of 4.5 billion lek, or $40.7 million. Could the Albanian branch be implicated in such suspicious activities? The Economist writes that when these news surfaced all these banks lost a good amount of their market share, for instance Swedbank’s share price has shed 18 percent, other European banks caught up in such allegations have lost around 20 billion euros in stock market value in the past six months, and Raiffeisen tumbled by more than 12 percent on March 5 after the complaint was filed. This is the biggest fall that the Austrian international bank has experienced in 11 months. “Until banks come clean and reveal the full extent of what suspicious transactions they have been involved in, this looks set to run and run,” said Philip Richards, a Bloomberg analyst said on its website. [post_content] => TIRANA, March 13- Statkraft Albania has signed a contract with Norwegian company Ocean Sun AS for cultivating solar panels with a maximal capacity of 2 MW at the hydropower tank of Banje in Elbasan. The project will consist of four floating units with 0.5 MW capacity each, and the overall investment amounts to 2.3 million euros. Statkraft is a leading company in hydropower internationally and Europe’s largest generator of renewable energy. The company which was born 120 years ago in Norway produces hydropower, wind power, solar power, gas-fired power and supplies district heating. The Group also deals with energy market operations. Statkraft has been present in Albania since 2007 and owns 100 percent of the Banje hydropower tank, which was opened in 2016. Ocean Sun AS is a Norwegian company founded in 2016 to make a change in the solar industry, and potentially to the whole of the energy sector. The company’s vision is to provide the technology that rapidly makes clean energy production the cheapest alternative to large populations around the world, with the hope of conversion from fossil fuels to renewable energy. The new technology will enable large-scale solar developments on coastal seawater, lakes and reservoirs. This is the first major commercial contract on floating solar technology from Ocean Sun. This project will demonstrate the implementation of a new technology developed based on Norwegian solar photovoltaics and maritime industry. “Testing new technology for floating solar power panels fits very well with Statkraft’s strategy to grow our renewable energy generation from hydro, wind and solar. If the technology is proven successful and the potential for cost-competitiveness can be achieved, a wider application of floating solar may take place in other Statkraft locations”, said Christian Rynning-Tønnesen, CEO of Statkraft. In December 2018, Statkraft Albania received a preliminary authorization from the Government of Albania for the implementation of a floating solar plant at Banja with a feed-in-tariff. Subject to final regulatory approvals, the solar plant will be constructed during 2019/2020. [post_content] => TIRANA, Mar. 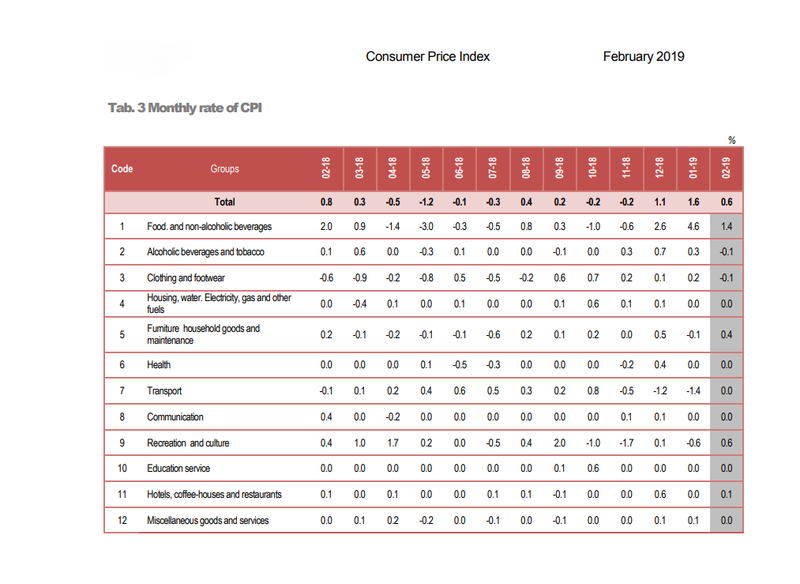 11- As the European currency euro remains unstable following another dropping against Albanian lek this week (as of March 11), together with lowered consuming from the citizens have added to a lowering on the level of inflation in Albania to 1.7 percent for Feb. 2019. This data is issued by the Albanian Institute of Statistics, INSTAT. The objective by the bank of Albania for the inflation level is to remain at 3 percent. According to data issued by INSTAT, comparing to Jan. 2019, the value has dropped by 0.6 percent. Comparing to Feb. 2018 the change amounts in 2.1 percent. A higher inflation means a country’s money supply grows faster than production in that country, making the average price to rise as a result of the increased demand for goods and services. It can be caused by higher costs being charged on to the end-user, or higher tax rates. These price rises cause the value of money to fall. You can therefore buy less with the same amount of money. But this does not need to have an immediate effect on purchasing power. Purchasing power only declines if wages rises less rapidly than prices. A 2 to 3 percent ratio of inflation is considered to be a normal level. Such low inflation is beneficial for the economy as it encourages consumers to buy goods and services and makes it more appealing to borrow money, as interest rates are usually lower during periods of low inflation. Therefore, a lower inflation is an important goal for governments and central banks because of the economic benefits. There is also another occurrence, deflation, which is negative inflation. Deflation causes the real price level falls, leading to buying more goods with the same amount of money as time passes. However, deflation can sometimes be bad for economic growth because it is very likely that consumers will postpone their purchases because they expect to have to pay less for them in the near future. Deflation is usually an indicator of a country’s declining economy. It’s hard to tell whether what is going on in Albania is just a lowering of inflation, or deflation. A lowering of inflation would probably lead to a better economy on the long-term, whereas deflation would be a pointer of a bad economic governance. The lowering of the inflation value in Albania seems to have been derived from currency exchange rates, because the prices haven’t really dropped. The data provided by INSTAT calculate the Consumer Price Index (CPI) in Albania. 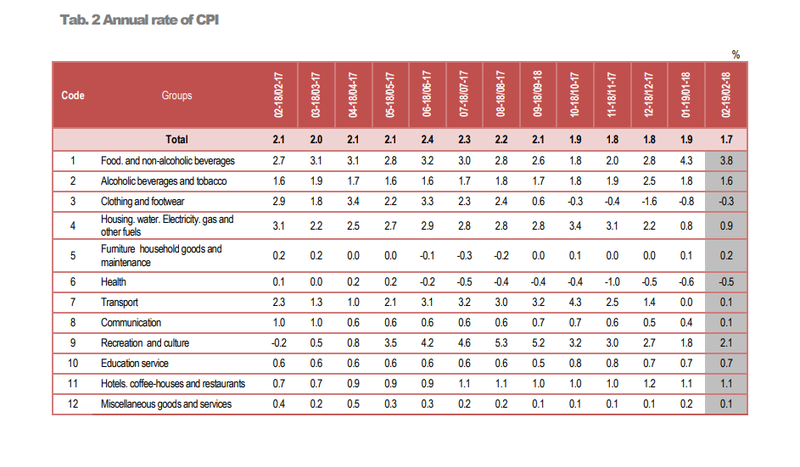 CPI measures the relative changes in prices of goods and services consumed by the families. It is calculated by using final consuming structure on which each family spends. The data is appropriated by the Family Budget Survey. As of Feb. 2019 the annual price increases has been mainly affected by “Foods and non-alcoholic beverages” by 1.37 percentage points and “Housing, water, electricity, gas and other fuels” by 0.18 percentage points. 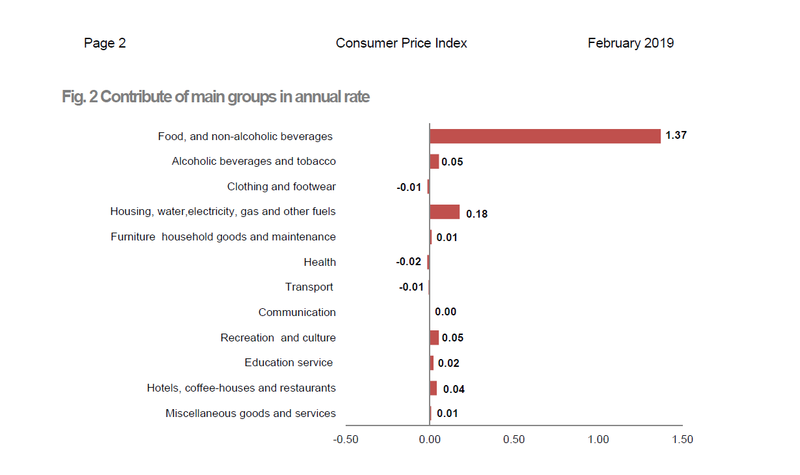 There has been an increase in prices of other consumer goods and services groups, such as “Alcoholic beverages and tobacco” and “Recreation and culture” by 0.05 percentage points. The prices of “Hotel, coffee-houses, and restaurants” increased by 0.04 percentage points, “Education service” increased by 0.02 percentage points, and groups “Furniture, household goods, and maintenance” with “Miscellaneous goods and services” increased by 0.01 percentage points. The data shows that there are consumer groups that experienced a dropping in prices such as “Healthcare” decreased by 0.02 percentage points, and “Clothing and footwear” together with “Transport” have decreased by 0.01 percentage points. Apart from the CPI, there is also another index called the Harmonized Index of Consumer Prices (HICP). It is a consumer price inflation index that measures the change over time in the prices of consumer goods and services acquired, used or paid for by euro area households. It is called harmonized because it is uses the same methodology for all EU countries. Thus, allows a better inflation comparing amongst EU countries, to ensure price stability. INSTAT defines the HICP as the change in retail prices of goods and services based on the consumer’s expenses on the final product. As of Jan. 2019 the annual HICP change was calculated at 2.4 percent with the largest contributor to the value was the group “Food and nonalcoholic beverages” with an increase by 5.4 percent. It is then followed by “Hotel, coffee-houses, and restaurants” with an increase by 2.9 percent, “Recreation and culture” increased by 1.8 percent, “Alcoholic beverages and tobacco” by 1.1 percent, “Housing, water, electricity, gas and other fuels” increased by 0.5 percent, and “Miscellaneous goods and services” followed a 0.4 percent increase. Consumer groups that experienced a decrease in prices were “Transport” by 0.6 percent, and “Clothing and footwear” with “Healthcare” by 0.5 percent. 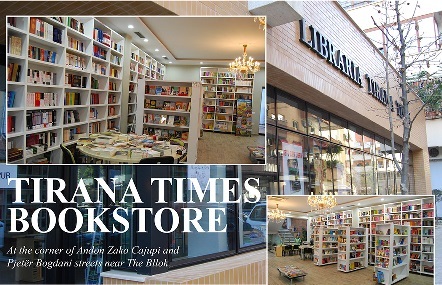 [post_content] => TIRANA, Mar. 7- March 7th in Albania is the Teacher’s Day, an event on which students express their gratitude to their teachers about their hard work to educating them. This day corresponds to March 7th 1887 when the first Albanian school was opened in our country. Thus, this day doesn’t only appreciate teachers, but education in general. 132 years later the education system in our country hasn’t gotten any better. The issues have deepened due to lack of finances, bad school infrastructure, a gap level of the educating body, and a drastic decrease in pupils due to birth rate shrinkage. If prior the ‘90s the government would finance the education sector with more than four-to-five percent of its annual GDP, today that financing is less than three percent. This number is 40 percent lower than the investments done in developed countries, and 20 percent less comparing to the other countries of the region. The financing from the government for the education sector as of years 2017 and 2018 was 3,1 percent of the country’s GDP. Out of this number it was learnt that one percent was paid by the parents through direct tariffs. These low investment was one of the reasons that pushed the students to hold a month-long protest in December 2018 so the government would increase funds to five percent of GDP as promised by the actual government during the 2017 elections campaign. The percentage of family financing increased significantly after the increase of higher education tariffs in 2015 (the university tariffs). These tariffs are paid by the students or family members on the budget of the Education Ministry, which then disperses it according to its needs. According to an analysis by UNESCO, comparing to the other countries of the European continent Albania continues a low financing in the education sector in proportion to its GDP. Albania was ranked last in the region with funds towards education in the region, as the other countries were spending 4-4,5 percent of their GDPs in this sector. During the transition years post-90s Albania has historically invested three percent of its GDP in education. Only in 2007 prior to the global financial crisis and economic recession did the funds barely reach a 3,2 percent. After the crisis the investment have been at a constant of maximum three percent. Also the private and family expenses for the education as a GDP ratio have been increasing since 2011. Following this pattern, the expenses achieved a 0,9 percent at the end of 2015, and slightly higher than one percent in 2017. The lack of financing has negatively in the quality of education, especially in the disadvantaged strata of society. Even though the protesting students required the promised five percent financing, the budget plan has foreseen a different situation. According to the middle-term plannings of the Ministry of Finance the expenses the government will implement on the education sector will be 3,1-3,3 percent of the GDP for 2018-19, and then will decrease again to three percent for 2020 and 2021. The latest data from the Albanian Institute of Statistics, INSTAT, the weight of expenses for the education comparing to the standards of living reached a record level of 4,4 percent of the total consumption in 2016. A decade before that number was 1,7 percent. According to surveys on family budgets for the region and EUROSTAT, Albanian families spend the most on education comparing to regional and EU countries. EU countries spend on average 2,1 percent of their total consumption in education. Serbia, Macedonia, and Bosnia-Herzegovina spend about 0.6-0,7 percent, and Croatia reaches 1,1 percent. The the ‘90s the sector of education has decreased with more than 30 percent in its body of teachers, schools, and pupils. According to INSTAT as of 2018 there has been a decrease of 35 percent in pupils attending mid-school (in Albania the first nine grades), comparing to 1991. 43,700 pupils attended middle school in 2018, comparing with 68,600 pupils in 1991. The data shows that there have attended 260 thousand pupils less since 1991, with the largest decrease in the past two years. This decline of pupil body has been followed by a reduction of the educating body too. In 1991 there were 4370 teachers nationwide. This number has been reduced by 22 percent during the transition years, amounting to 3390 teachers nationwide nowadays in our country. In 1991 Albanian counted 2200 schools, and today that number is down by 35 percent, to 1134 schools. In 2018 only, 150 schools in regional areas closed their doors because they didn’t have any pupils. According to data from INSTAT this decrease in numbers has brought a lower pupil per teacher ratio, in 17,8 for the academic year of 2017/2018. A significant number of Albanian students are leaving the country to study abroad. A 2016 UNESCO data statistics about the students movements globally, counted 17,397 Albanian students having left the country to study in a foreign university. Considering Albania’s population of three million residents, this number is quite high. Comparing to USA for instance, which holds a population of 325 million people, only 72830 of its students left to study abroad. As that high number of Albanian students left the country, Albania received 2115 incoming students. According to the data from UNESCO regarding these numbers of outgoing Albanian students, 10,724 left to study in Italy, 1633 students attended Greek schools, 886 left for Turkey, 715 attended a school in USA, 481 in France, as well as other European countries, Canada, and even Saudi Arabian schools, with a very small number of students registered. These data however, do not include Albanian students studying in Germany during 2016, which implies that the EUROSTAT claimed statistics for these students might be even higher. The foreign students that came to study in Albania were mainly from Italy, with 449 student, 292 Montenegrin students, 287 from Serbia, 188 from Northern Macedonia, 155 Turkish students, and Greece with 49 students. This study from UNESCO serves to analyze the preference changes in higher education abroad among students, especially in developed countries. A research from the World Bank shows that the productive of 56 percent of the world’s children will be less than half of what it could have been, if these pupils would have gotten a good education and enjoyed full health. Hundreds of millions of children globally reach adulthood without any basic abilities, such as simple computation between two numbers, reading medical directions, or the bus schedule. One many ask how would these children provide parenting and education to their own future children. A good education positively affects human capital, from which both individuals and societies profit. Education for individuals increases self-esteem, and their chances of employment and higher income. A good education could help in the strengthening of a country’s institutions within societies, encourages long-term economic growth, reduces poverty and stimulates innovation. The World Bank will be launching “Successful teachers, successful students” in supporting countries which are reforming their education systems. This global platform addresses the main challenges to make teaching more effective towards students. One of the main reasons of the education crisis in many education systems of developing countries is due to lack of data of who is learning and who’s not. This makes the situation difficult to change. The World Bank has suggested to schools and teachers to at least prepare students with the ability to write and read. However, more than that students should be able to interpret information, think critically, be creative, communicate well, cooperate, and be flexible. [post_content] => TIRANA, Mar. 5- 2019 has started as a difficult year for the Albanian finances. Official data from the Finance Ministry show that as of January the budget revenue dropped by 2,5 percent comparing to 2018, or 900 million lek ($8 mln) less. The detailed statistics show that the main reason of this decline were the non-taxed revenues, but in parallel also the revenues accumulated from taxes with a slow progress. According to the fiscal tables, the General Directorate of Taxation and the General Directorate of  Customs accumulated 200 million lek ($1,79 mln) less this Jan. 2019, than the previous year. The most problematic areas were the excise, national taxes, and the VAT, even though the latter is linked to the significant increase on business reimbursements. In Jan. 2019 the government returned 1,7 billion lek ($15,29 mln) worth of VAT to private enterprises, which comprises of a record turnover with an increase of 70 percent comparing to 2018. The International Monetary Fund and the World Bank warned that 2019 will be more challenging for the Albanian economy, due to a Eurozone slowdown. The state budget seems to be experiencing the first pressures of this slowdown. The preliminary data actually suggest that the revenue progress on the budget has been also constrained in February, raising concerns that the government will be forced to cut public spendings, or buckle the VAT turnover to taxes. The initial budget plan foresees that the government will reimburse 1,7 billion lek worth of VAT to private enterprises each month, settling thus the lagged debts. However, if the revenues will keep displaying a slow progress then it is likely that the arrears towards business won’t only not be liquidated, but might be further deepened. [post_content] => TIRANA, Mar. 5- Europe’s market currency euro has dropped again after a rise it had received in the past two weeks. Throughout the month of February euro gained 2 points against Albania’s official currency Lek, but lost it again. The Bank of Albania currency for one euro is at (maximum) 124.9 lek. Euro has had a fluctuating value over the past 10 months. After the peak season in summer euro started dropping in September 2018, then hit a five-month low in October of the same year, where it was in a balanced 126 lek per euro. These values that euro had received are the lowest since a decade. Market actors admit that this drop was expected because the evaluation of euro came from temporary factors that were connected to the profits transfer of major companies, which imposed an increase in the demand of euro in the internal market. Data from the Bank of Albania claim that the outgoing revenue from investments amounted to 296 million euros, most of which were profits transferings. The BoA bought a 500 million euros Eurobond issue in 2018 to combat the free fall of the euro comparing to the local lek. Euro’s free fall has had a series of negative effects for Albania’s highly euroised economy, mostly hitting Eurozone-destined exports, local producers facing tougher competition from cheaper imports and sizeable Euro-denominated savings and remittances. On the positive side, repayment of loans became cheaper for about half of borrowings denominated in euro and the government’s external debt although the government was forced to revise down its 2018 budget on lower tax income from imports due to the euro-depreciation effect. Using a fast-track procedure known as the ‘normative act’ intervention for the second time after a similar review in mid-2018, the ruling Socialists have proposed to cut both initial spending and revenue targets on the 2018 budget by 2.8 billion lek (€22.6 mln). In its 2019 budget, the government cited the euro’s free fall effect hitting customs revenue as the main reason behind the revenue underperformance. The finance ministry says the depreciation of both the euro and the US dollar has negatively affected customs income for all categories of imported goods, hitting revenue by 6 billion lek (€47.8 mln) for the first eight months of 2018 and expected the blow to extend to 9 billion lek (€71.7 mln) for the whole year. On the positive side, the euro’s free fall has reduced interest rates on sizable Euro-denominated loans for both the Albanian government and businesses and households. The market now is back to its normal standard where the offer for euro is higher comparing to its low demand. Its local circulation is also rather low. According to the BoA the actual value balance that euro is maintaining is 124-126 leks per euro. The BoA has foreseen that the currency exchange market will be stable this 2019 comparing to last year when euro reached its lowest value since a decade. This came due to uncommon factors such as banks’ capitals conversions and a loan given from the European Bank for Reconstruction and Development (EBRD) to Albanian Power Corporation (KESH). [post_content] => TIRANA, Mar. 4- Deputy Prime Minister of Kosovo Fatmir Limaj said for Radio Evropa e Lire (Free Europe Radio) that the telecommunications roaming tariffs between Albania and Kosovo will be removed starting May 2019. Limaj also serves as national coordinator between the two countries. [post_content] => TIRANA, March 5 - The Albanian Exporters Association confirmed in a statement that it is attentively following the political, economic and social situation of the country, the boycott of institutions and institutional political processes, as well as the real and verbal violence taking place in the media, parliament and the streets. The association noted that many other relevant actors in the country have highlighted as a consequence of this situation the hampering of most integration processes and the rhetoric that follows these processes - undoubtedly a concern considering integration is one of the country’s most strategic goals. 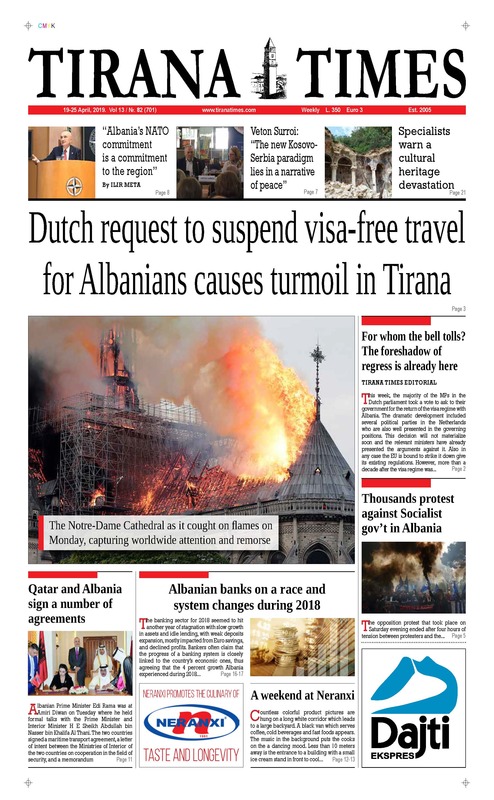 In terms of the real direct effect this situation will have on the Albanian economy is mainly the major negative impact on the upcoming tourist season - an undoubtedly serious concern, taking into consideration how the sector has been promoted over the last few years to bring the country income and to further assist its integration process. In this context, the AEA raised alarms that the actors who have brought about this situation while still being obliged to manage the country’s stability should take measures and do two main things. 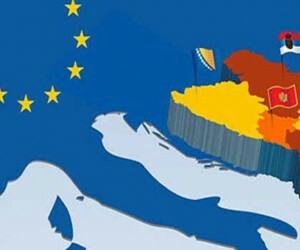 Firstly, the AEA said political actors should highlight and expose the real negative effects Albania’s deadlock has brought to the economy, foreign and local investments, exports and the general development of the country. Secondly, they should responsibility and concretely engage to come up with lasting solutions that will no longer aggravate the situation, but rather minimize its consequences. The situation, which many experts have valued as anarchic and with a tendency to incite conflict, has eclipsed every every debate in function of solving economic problems, improving the business climate and promoting investment and exports. According to statistics, the first month of the year concluded with a 7.3 percent drop in exports compared to the same month of 2018 - a trend which, if further follows, will directly affect the dissemination of new jobs and the decline in investments from the most vital economic sector. Similarly, if destability is added to the problem of the euro devaluation, the lack of labor force and the non-payment of VAT, that would be the end of exporters and producers. The AEA added that nothing and no one can justify the facilitation of chaos, anarchy and the incitement of vandalism to accompany social conflicts, as it has always happened in Albania everytime something like this happens. Damaging the entrepreneurial initiative and confidence that “business can be done normally in this country', where property and capital security “is not endangered by the rhetorical dynamics or the depreciation of institutional processes” will undermine the direct and long-term development of the prospect of development for Albania. A situation threatening property and entrepreneurs will cause the latter (be them Albanian or foreigners) to completely withdraw from any kind of business or development idea in Albania with the impression the country can’t be helped. The AEA said in conclusion that it supports all foreign and Albanian institutional, social, political and media factors requesting that reason, the constitution, law and institutions guide decision-making and political stands as the only way towards Albania’s stability and economic progress. [post_content] => TIRANA, March 4 - The American Chamber of Commerce in Albania says Albania should follow neighboring North Macedonia’s example in settling its long-standing issue of unclear property titles and stop political and media attacks on current US investors in the country. The remarks are made by Mark Crawford, the outgoing President of the AmCham, in a comment published on the latest issue of Advantage, the official magazine of the American Chamber of Commerce in Albania. “The first item that Albania has yet to complete is the availability of a free online map of the country, land registration and related ownership via e-Albania in conjunction with the Immovable Property Registration Office. Clear land ownership is the basis for economic activity – full stop,” says Crawford, an American investor in Albania, who wrapped up his third and final two-year term as President of the Board of the American Chamber of Commerce in Albania. “The Albanian-American Diaspora has been clear and consistent, stating that the lack of online access to land registration data depresses investor appetite. Such a map is achievable (as evidenced by Northern Macedonia’s online land registry map and helpful for both foreign and domestic investors,” he adds. Unclear property titles is one of the key barriers to attracting foreign direct investment in Albania, where more than half of the country’s immovable property has ownership problems, in a situation that has severe consequences for the property owners themselves, but also the country’s business climate. The complicated property issue is a result of a controversial agrarian reform in the early 1990s following the collapse of the communist regime and subsequent non-transparent privatization of state-run property as well as dozens of thousands of illegal constructions built either on private or state-run land during the past 27 years, a considerable part of which already legalized and registered with real estate registration offices. The Albanian Parliament has already approved legal changes that target providing a final solution to the problem but due to complicated issues related to mistakes and abuses in initial land distribution certificates in the early 1990s, lack of accurate maps leading to overlapping, field verification and the establishment of an electronic register authorities estimate that could take a decade. Mark Crawford says Albanian politicians and media should be more careful in taking care of existing American investors whom he describes as the best advertisement both for, and against, future investment. His comments come following political and media attacks against a commercial bank with American capital and vandalism against a US-owned telecom company operating in the country. “I would have the government majority and opposition both make a conscious effort to take care of existing foreign investors. I have seen a systematic schizophrenia between political players trying to attract investors, then pushing them out (often leading to public arbitration suits) or even vilifying them in the media,” says Crawford. “American investors are often keen to follow success, therefore when a company like ABCom, owned by the SEAF investment fund in Washington DC, complains about malicious vandalism in 2018, it is noticed by American investors. When various political figures attempt to vilify the largest American investor in Albania, namely NCH capital from New York, or their projects such as the American Bank of Investments, then it appears bizarre and anti-American investment,” he adds. According to him, investment vehicles in tax neutral countries or states, such as offered by Delaware, Holland, or other off-shore entities are commonly used by US investors to aggregate funds in a tax neutral manner, and as such are not of particular concern for Albania insofar as US investors in Albania are often subject to oversight by the U.S. Securities and Exchange Commission. US investment in Albania has increased during the past year after a US-Albanian-owned bank acquired a Greek bank unit through a merger and a private hospital with American capital purchased its main rival, increasing market shares in the banking and the private healthcare sectors. Official US investment in Albania reported by Albania’s central bank was at €89 million at the end of 2018, but the investment value is estimated much larger due to US investment often flowing through tax neutral or offshore countries. "Building upon that by establishing transparency of land ownership rights, taking care of existing investors and being present to attract investment funds, Albania can take further and faster steps forward," he adds. A higher tax burden compared to other regional countries applying lower rates, red tape, limited competition and difficulty in finding qualified staff are some of the top concerns for foreign and Albanian businesses represented by the American Chamber of Commerce in Albania, according to a 2018 AmCham survey. [post_content] => TIRANA, Feb. 28 - Albania's construction industry received a major boost in 2018 and the emerging tourism industry where major investment is being carried out played a key part although credit to the sector as a whole registered sluggish growth, giving rise to allegations of money laundering that some economy experts and the opposition link to the euro’s free fall in the country. Construction permits in the country hit a 7-year high of around 1,200 in 2018, up 45 percent compared 2017 and five times more compared to the annual average from 2012 to 2015 when the sector was almost paralyzed before slightly recovering in 2016 as the country launched e-permits, according to INSTAT, the state-run statistical institute. While around three-quarters of permits are awarded for residential one or two-storey buildings, there has been rising interest to invest in tourism facilities in the past couple of years as more tourists visit the country and tax incentives support the industry. Tourist resorts are being developed both along the Adriatic and the Ionian, but a long-standing property issue remains a key barrier to attract major foreign investors. Data shows the number of permits issued for hotels and other tourism facilities increased to 75 in 2018 at a total surface of 1.4 million m2 and investment value of 59 billion lek (€468 million), in a number almost equal to construction permits and investment during the whole 2014-2017 period. The hike in 2018 investment comes as the government has offered a series of tax incentives and more local investors diversify their investment in a key promising sector. However, the recovery of the long-ailing construction industry comes amid allegations that drug and crime proceeds are being laundered into the sector that uses the euro as its main currency considering that credit growth has been quite small. Europe’s single currency currently trades at a 10-year low of 125 lek, having lost around 7 percent against the Albanian lek during the past year, in a free fall which the main opposition Democratic Party links with a hike in euro inflows from drug and other crime proceeds, but which the government and the central bank say is a result of recovering economy and higher inflows from tourism and foreign investment. 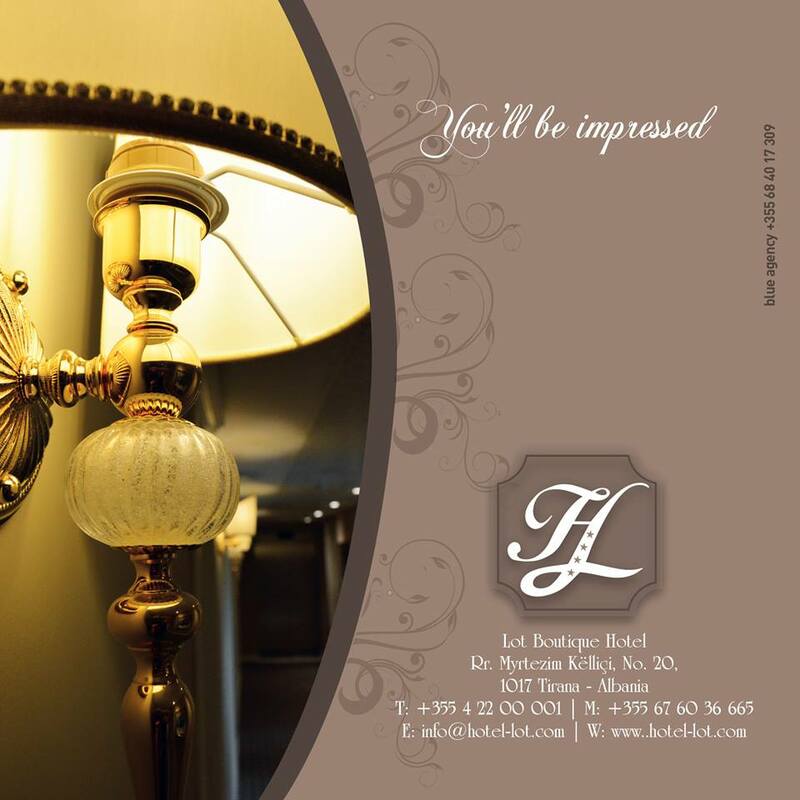 New luxury accommodation units built by internationally renowned chained-brand hotels or under management or franchise contracts with them, have been benefiting tax incentives for a ten-year period for building and operating four-star hotels and resorts with an investment value of at least €8 million or five-star units worth at least €15 million, according to a package of tax incentives Albania approved in late 2017. The increase in construction permits also comes amid tighter measures against illegal constructions and at a time when Albania has made available an e-permit system, making dealing with construction permits a much easier process, although it still remains one of Albania’s worst doing business indicators. The number of construction permits saw a sharp decline from 2012 to 2016 dropping to a few hundred down from more than 1,000 annually before 2011. The construction sector accounts for about 11 percent of Albania’s GDP and employs about 6.5 percent of the population, down from a record high of 18 percent of the GDP and 10 percent of private sector workers just before the onset of the global financial crisis in 2008. While demand for new apartments in Tirana remains satisfactory, tight lending standards and poor demand remain a key barrier in other Albanian regions where thousands of apartments remain unsold especially in Durres and Vlora. Developers have recently shifted to building tourist resorts and villages in coastal areas as tourism rapidly grows and the government is offering tax incentives for luxury four-and-five star accommodation units. Hilton Garden Inn, a mid-priced brand owned by Hilton Worldwide, has already launched its first hotel in Tirana, while US-based giants Marriott International and Hyatt are expected to start operating in the Albanian capital city following franchise deals with Albanian developers.